Code Confidence™ Tools provide the most productive debug environment for embedded application engineers working with the FreeRTOS™ kernel. 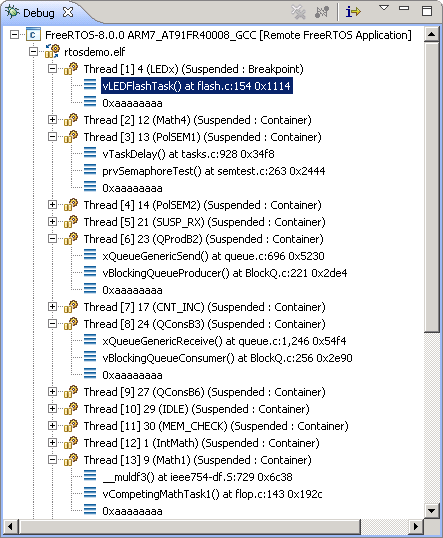 Hardware Debugging for FreeRTOS is fully integrated with the award-winning Eclipse™ Platform (IDE) and C/C++ Development Tooling (CDT), providing a seamless debugging experience. Remote Debugging Launcher. 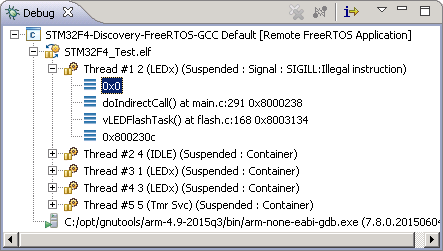 Our launcher works in conjunction with GDB and with JTAG, SWD or BDM debug hardware supporting the GDB Remote protocol. It enables the downloading and launching of FreeRTOS applications in RAM or Flash memory (subject to debug hardware capabilities). 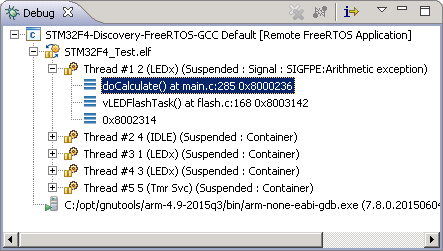 The application is observed suspended within the vLEDFlashTask() function of the LedX task. Other tasks are observed waiting for kernel events or swapped out during long-running computations. Exception Debugging. 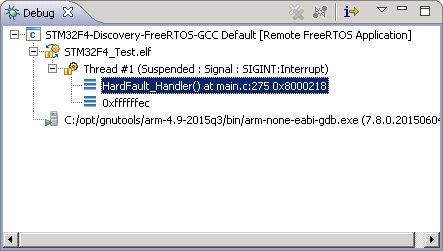 Decoding of hard fault exceptions on Cortex-M3, Cortex-M4 and Cortex-M7 hardware only. Our tooling works in conjunction with a tiny hard fault exception handler (supplied) to deliver immediate access to the call stack and local variables preceding a hard fault exception. Both FORCED and VECTTBL events are accommodated. Technical Support. Our strong support focus ensures that you are not on your own. A comprehensive User Guide is included, backed up by a user community support forum. Product updates are delivered using the Eclipse update mechanism where necessary.